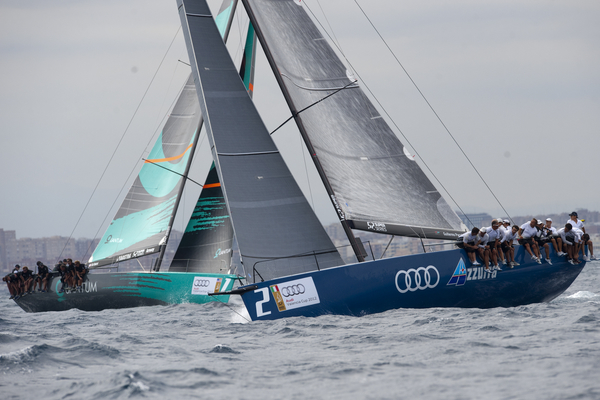 After three races off Valencia in brisk winds and an awkward chop Audi Azzurra Sailing Team lead the Audi Valencia Cup, the final event of the 2012 52 Super Series season. 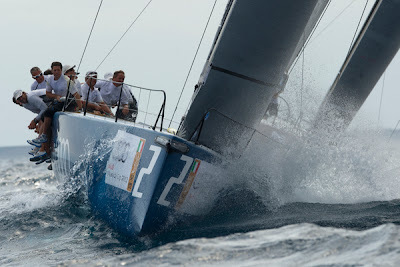 The team from the Yacht Club Costa Smeralda won both of the first two races and were leading the third before disaster struck. A big gust and wind shift struck in the final metres of the day’s final race caused the kite of Audi Azurra Sailing Team to touch the committee boat’s antenna. 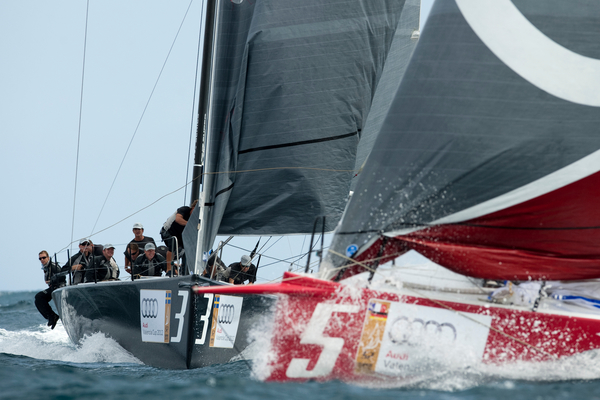 They were forced to drop their gennaker and do a penalty turn that saw the team skippered by Guillermo Parada slip to a fifth place finish. “It was the perfect day until the last 30 seconds,” said Azzurra’s navigator Bruno Zirilli. 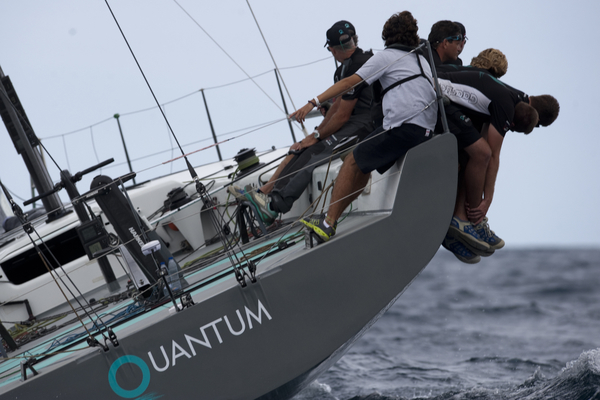 Championship leaders Quantum Racing looked a bit off their game in the first race but the series leader finished fifth in the five boat fleet. They improved with a third and second but are in fourth overall, locked on 10 points with Rán and Gladiator. 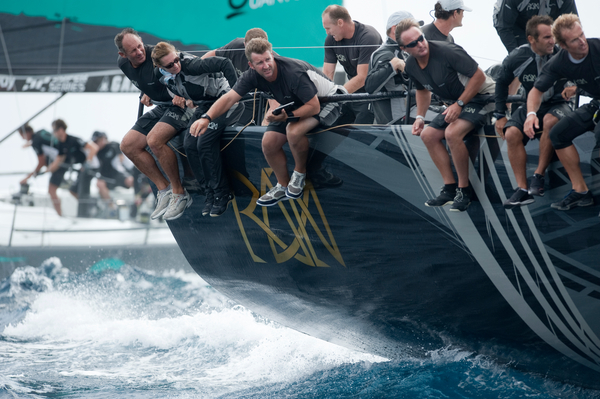 The day's first race was contested in a 12-14 knot nor' easterly breeze with Audi Azzurra's afterguard of Vasco Vascotto and Francesco Bruni getting the best start. 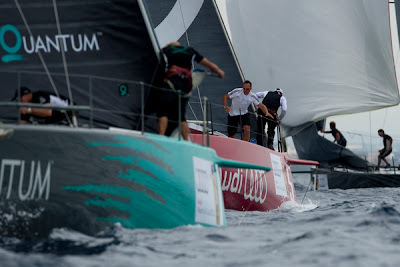 They duelled to the right of the upwind, trading tacks with Quantum Racing, the duo lost out to the group which went left. 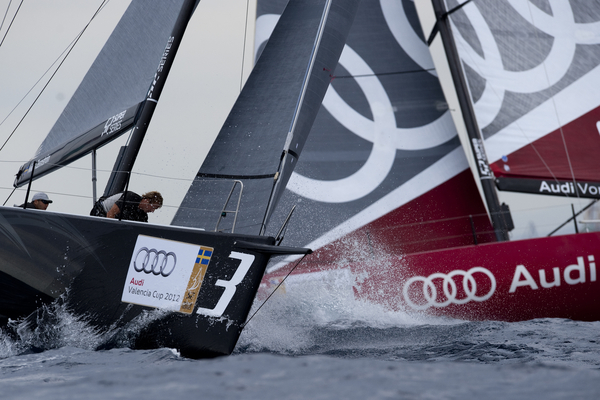 Audi All4One lead around the windward mark but on the final run smart tactics and good speed saw Audi Azzurra pip the Franco-German team on the finish line. 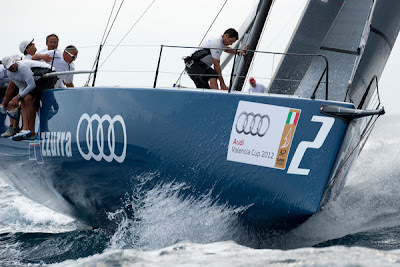 The second win was more decisive for Audi Azzurra. They lead at the first mark and extended on the first run, going on to win by over 90 seconds from Audi All4One. In the third race Audi Azzurra looked to be in command, leading down the final run. But all of the race had been sailed with a dark cloud over the centre of the leg, yielding two different breezes on the extreme sides of the course. Rán challenged from second at the final windward mark with consistently better use of the breeze. 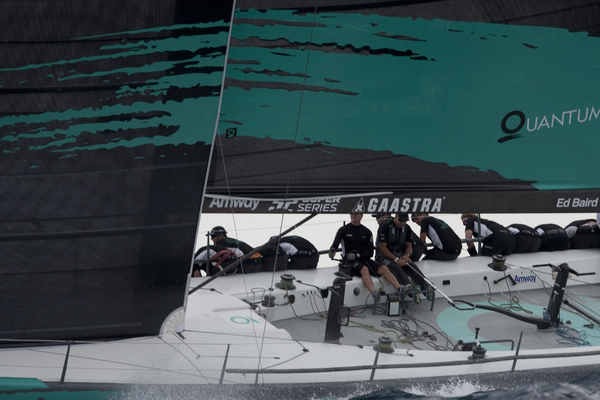 They were just far enough ahead to squeeze across the line to win as the big gust hit, heading them and destroying their spinnaker. Quantum Racing accelerated over Azzurra in the puff to take second, while the erstwhile race leader grazed the rolling committee boat’s antenna with their kite. "Honestly we just need to sharpen up in every single department. We are just getting used to be being back on the boat. We all have not been on it for a while. It is a little bit of everything, we will have it straightened out for tomorrow, we will have it out of our system,” said Quantum Racing’s tactician Andy Horton.